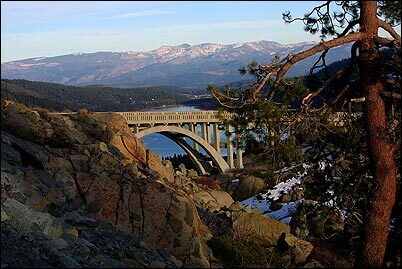 Donner Summit is the area along Interstate 80 that crosses over some of the highest elevations of the Sierra Nevada. It is approximately 10 miles east of Truckee and is often one of the favorite areas to ski and stay for Sacramento and San Francisco Bay Area residents due to its proximity to the interstate and ease to get home on busy weekends. The Donner Summit area offers several downhill ski and snowboard areas such as Sugar Bowl, Boreal, and Donner Ski Ranch. Cross Country skiing is also available. Serene Lakes offers an ideal peaceful mountain setting in both the winter and summer months. Please check out our list of Vacation Rental options for the beautiful Donner Summit area.